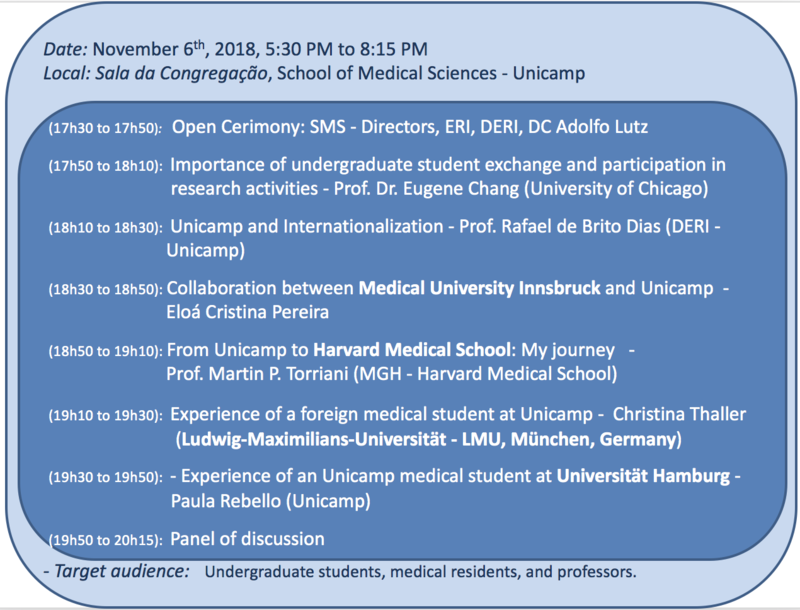 The International Office (ERI) of School of Medical Sciences (SMS) of University of Campinas (Unicamp) is organizing the V Symposium of Student Exchange of SMS - Unicamp. The event will be held at Sala da Congregação of SMS on November 6th, 2018, from 5:30 PM to 8:15 PM, with the participation of international guest, Prof. Eugene Chang, from University of Chicago. The program below shows participation from Medical University Innsbruck, Ludwig Maximilians Universität (LMU - München, Germany), and Harvard Medical School, and Universität Hamburg, by videoconference. The inscriptions can be done by e-mail gti@fcm.unicamp.br, sending the complete name and cell phone. The participation is limited by the room´s capacity. The event has support from the SMS board, International Office of Unicamp (Diretoria Executiva de Relações Internacionais - DERI), and Diretório Científico Adolfo Lutz.